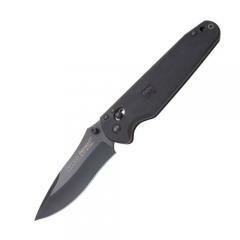 SOG VS-02 VS-02 Visionary II Plain Edge Folding Knife FREE SHIPPING! Wield the power of Japanese steel and the rugged, dependability of SOG with the VS-02 Visionary II Plain Edge Folding Knife. Constructed from VG-10, high-carbon Japanese steel, the knife features a virtually indestructible blade that is guaranteed to hold an edge. Designed for tactical use, SOG's Visionary II utilizes a low profile, glass-reinforced handle to provide reliable grip with superior handling that will not deteriorate with everyday wear. Ready for full use in seconds, Arc-Lock® technology rapidly deploys and locks the blade into place with the tap of a button. Dual thumb studs and a reversible pocket clip complete the package, for full ambidextrous and versatile everyday carry. ©2002-2019 CopsPlus.com: SOG VS-02 VS-02 Visionary II Plain Edge Folding Knife FREE SHIPPING!